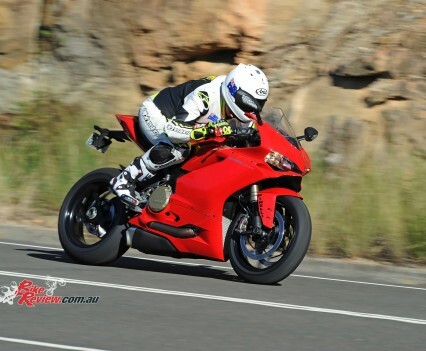 As explosive and fast as the 1199 was on the circuit, that same endearing feature along with less than perfect fuelling below 6000rpm made it a difficult motorcycle to ride under normal road conditions. 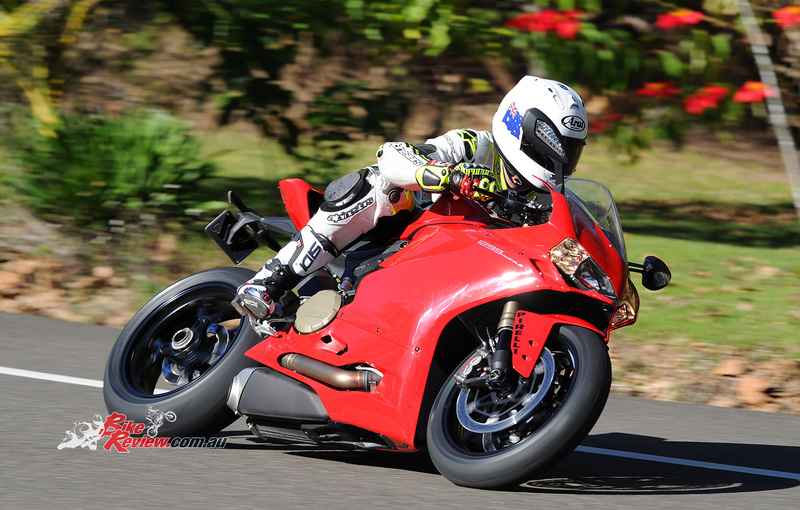 The suspension was also very stiff and the heat issues made the rider uncomfortable. 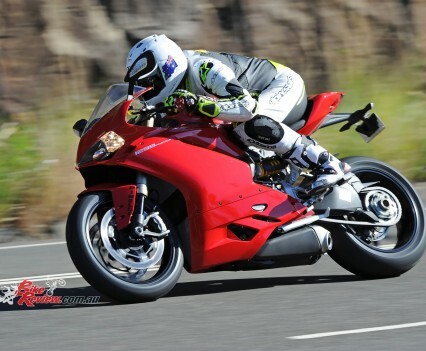 No excuses are needed by Ducati, as the 1199 was built purely with lap times in mind. 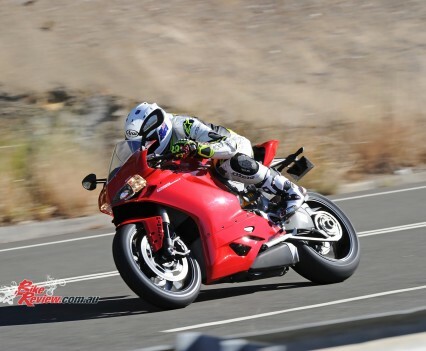 In 2013 the amazing 899 Panigale was released and Ducati openly discussed this machine being primarily designed for street use at the World Launch I attended in Imola. 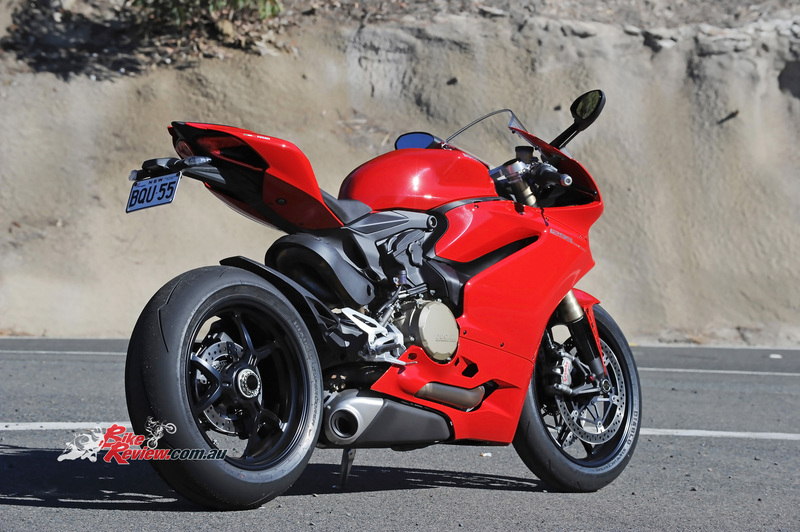 Certainly, Ducati hit the mark with the 899 and press all over the world praised it for sensational manners on the streets. 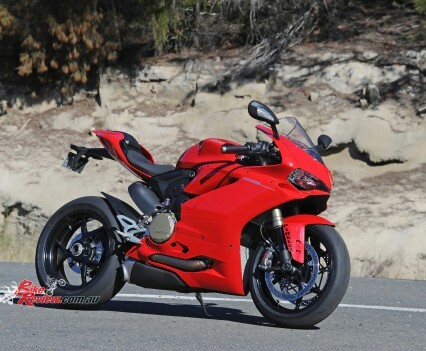 Many, myself included, opting to have an 899 in the garage over the more powerful 1199. 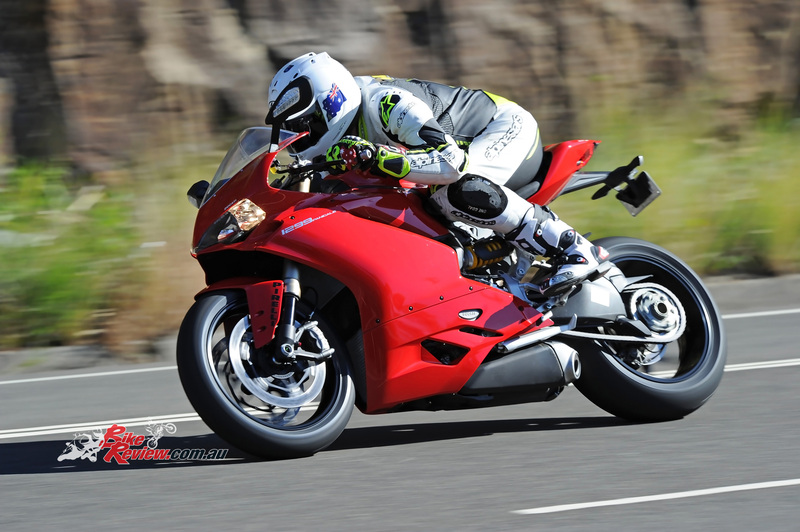 Fast-forward to 2015/16 and we are presented with the stunning, radical, even more powerful 1299 Panigale. 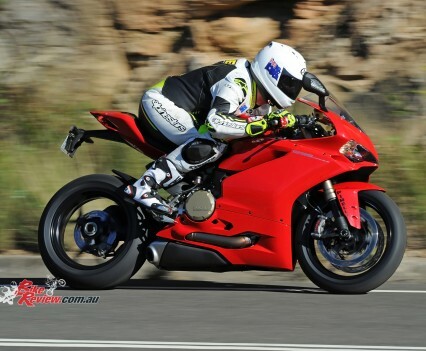 My first thoughts, admittedly, were that if the 112mm-wide combustion chamber on the 1199 struggled to efficiently burn with a single spark plug in the lower rev range, how the hell is the 116mm 1299 going to be better at low rpm? 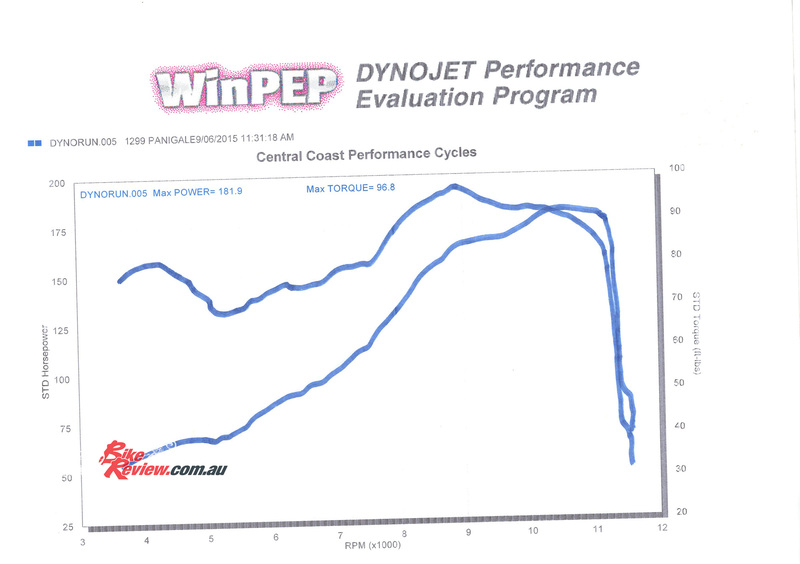 The answer is a combination of improvements from crankshaft and flywheel weight reduction to compression ratio, EFI management and electronic control. 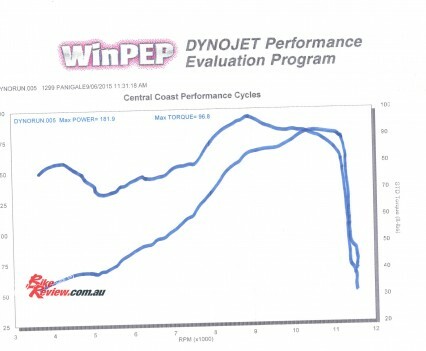 Add to that revised spring rates to give the bike a more compliant ride on real roads and the result? 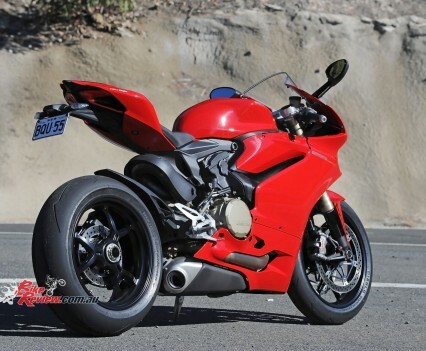 First of all, the 1299 is an extremely appealing motorcycle from a visual perspective. With it parked in my garage, I could just sit and stare and drink beer for hours. Which is exactly what I did on the night it arrived at Chteau Ware. 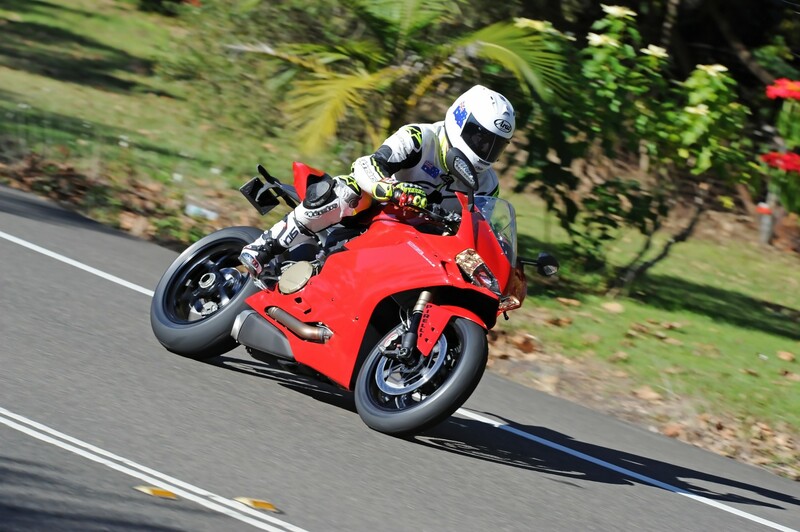 The more Peroni I consumed, the sexier this 1299 got. 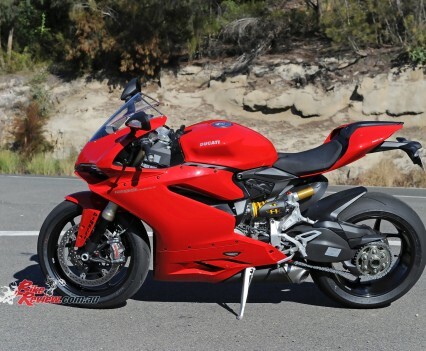 Every inch of this bike oozes detail and quality. The paint is deep and rich, the anodising perfect. 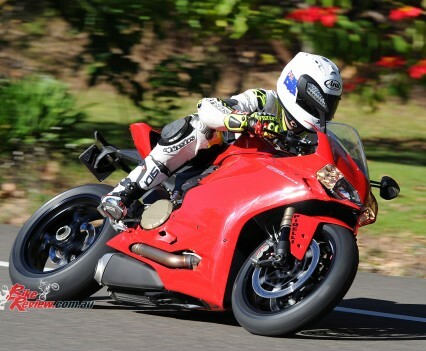 I fire up the 1299 and it booms into a fast idle that is deep and unmistakingly Ducati. I gear up as the bike warms up. The sun is shining, it’s mid-week and I’m not expecting many on my local roads. It’s going to be a good day. With no expectations of what the 1299 will be like, having avoided reading any World Launch reports until I sample the bike for myself, I hop on and get acclimatised. I notice the plusher suspension immediately. I also like the dash and have a muck around to re-familiarise myself with the options and controls. I do a quick check to make sure the Riding Modes are set as per factory settings then select first gear and roll on off up my street. 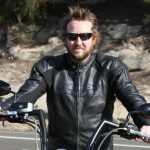 Within a few minutes I am comfortable and settling in on the bike. 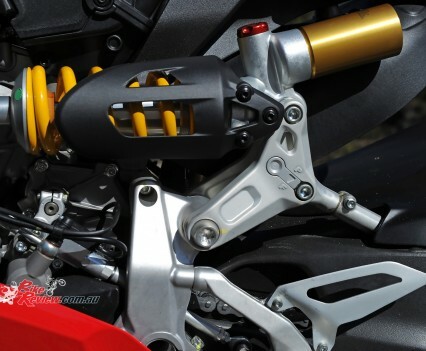 I like the feel of the new ‘pegs, they are not slippery like the 1199 ‘pegs. I like the ride the suspension is giving and best of all, I am blown away by how civilised the bike is in traffic. 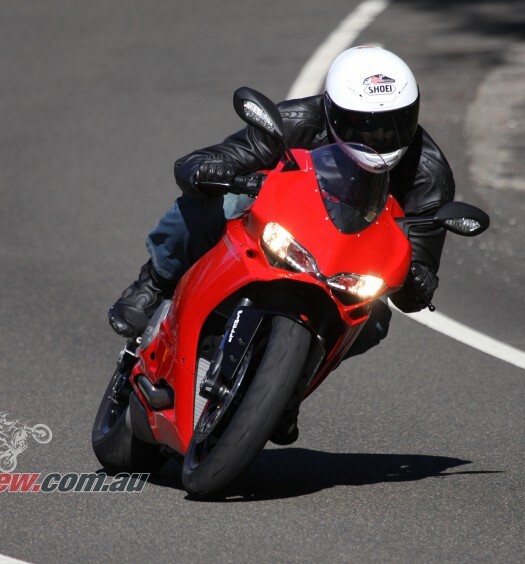 As I meander through peak hour the 1299 remains smooth and hovering around the 90-100C mark. 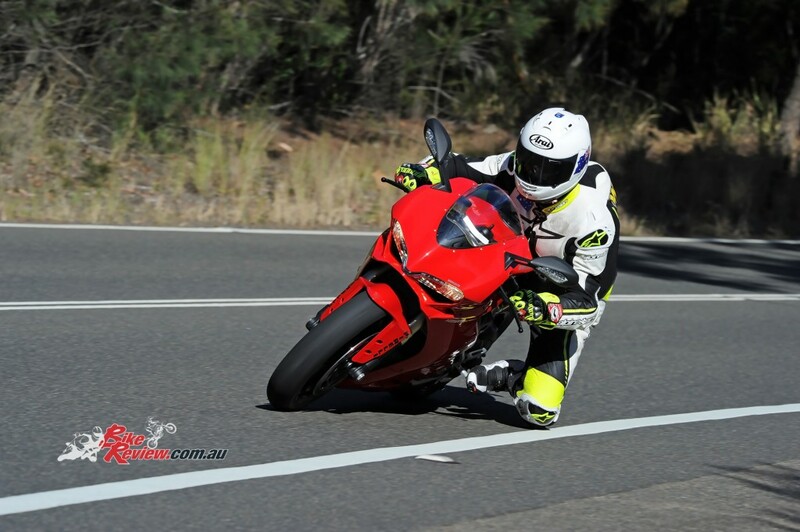 My legs are warm, not unbearable hot like on the 1199, so there is improvement there. 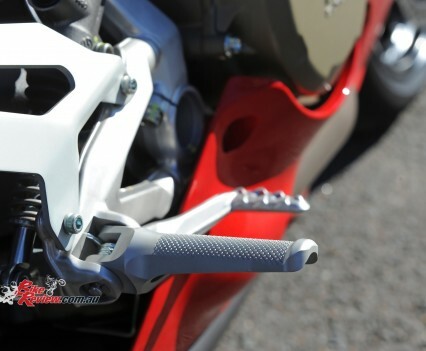 The clutch action feels lighter and much smoother on take-up. 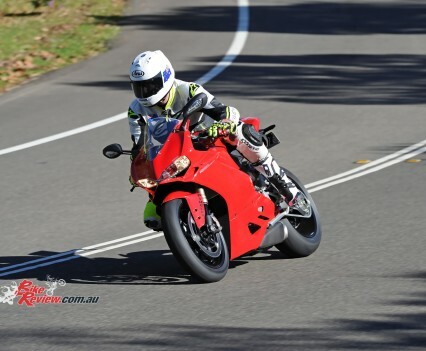 The engine is smooth and easy to control from as low as 2000rpm and I’m in shock. I expected it to be worse than the 1199, not on par with the 899 in these conditions. 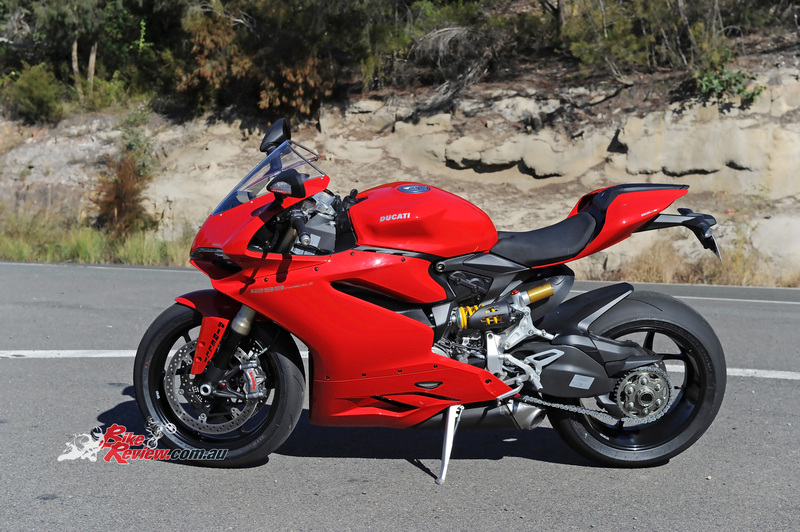 Well-done Ducati! The DQS is smooth and glitch free in traffic but under the current conditions I find myself preferring to back-shift the old way rather than using the auto-blip available. 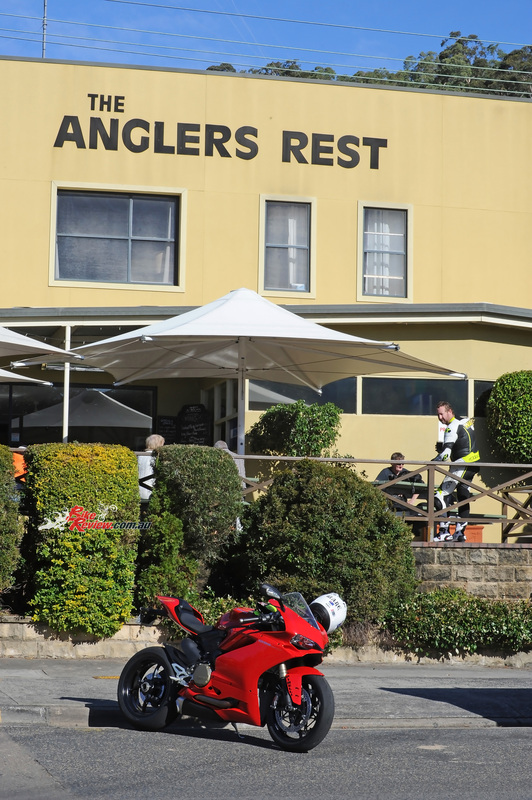 I arrive at the start of my country roads loop, stopping at a servo for a $1.00 coffee feeling comfortable and relaxed. 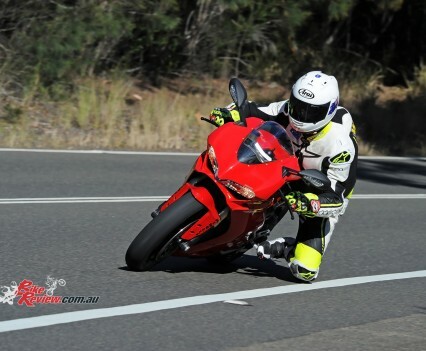 The same trip on the 1199 used to be quite taxing. I’m impressed. Getting in the groove as the Spring sun warms things and the morning fog clears, I take the opportunity to test the revised suspension on one of the more knarly, snotty and bumpy roads I use. 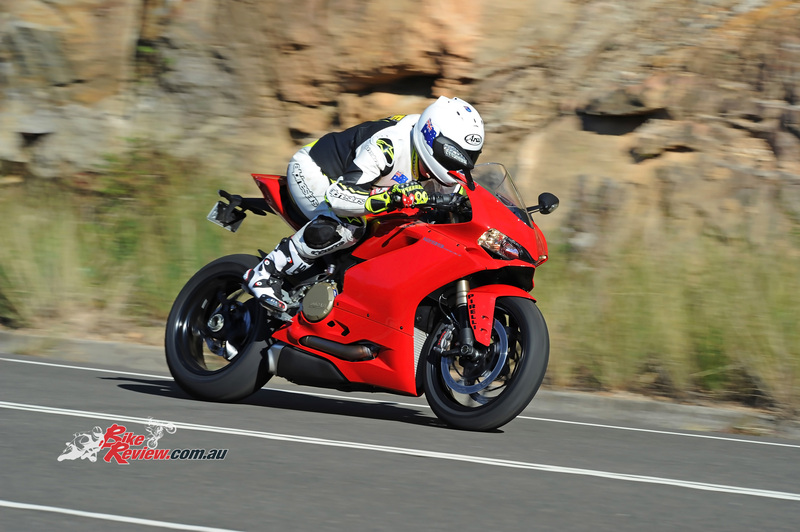 Knowing the grip from the fabulous Pirelli Supercorsa SP tyres won’t let me down, I open up the taps of the big 1299 – in Sport mode. 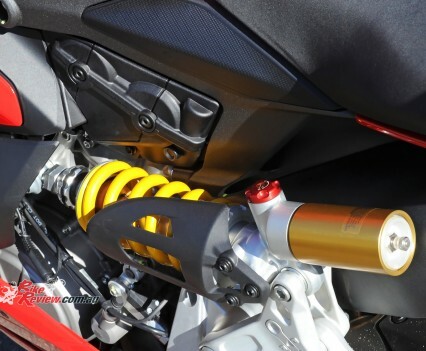 The combination of high compression, reduced crank rotating mass and an impressive dry weight of 166.5kg mean I’m having the ride of my life and even better, the handling and roadholding of the 1299, with it’s 50mm pressurised Marzocchi forks and high quality Sachs shock, is second-to-none on this road. 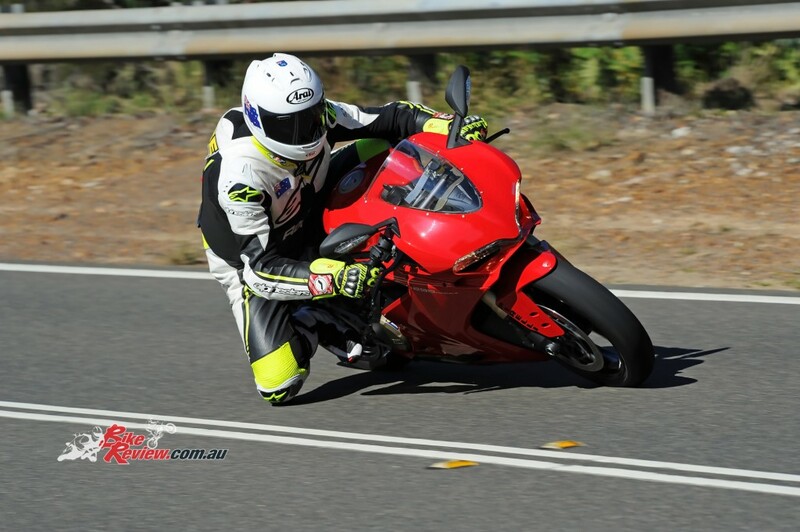 It’s a road that I truly loathed on the 1199 and previous 1198. 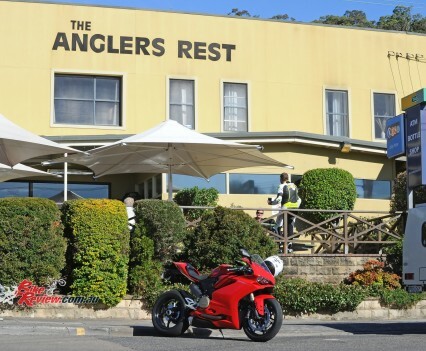 It seems the days of forgiving a Ducati for every misbehaviour on the bumps once you experience the nirvana on a smooth surface are over – as I soon find myself knee down on the smoother sections, without even thinking about it, and scratching my favourite road with complete confidence and, most importantly, a high level of enjoyment. It’s exactly 10:25am when I stop for fuel for the second time. As it gets dark and cool, six hours later, I’m back at the same servo for my third fuel stop. I’ve been going up and down the same road all day long, testing Race Mode, Sport Mode, variations within both and anything else I could play with. Race Mode is insane. The throttle is instant and it makes me laugh like an idiot. Only the dark and rain send me home at the end of the day, along with the threat of sure death if I don’t help bath and feed three kids! 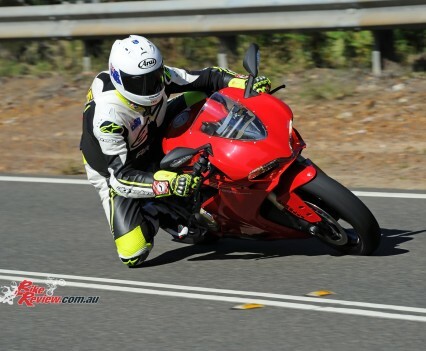 Riding home in the dark and wet on the Panigale gives me opportunity to experience the brilliant 120hp Wet Mode and to use the fantastic headlights and dash. My only criticism being I keep opening the Riding Mode menu whenever I press the indicator button to make sure indicators are off (a habit we should all have). 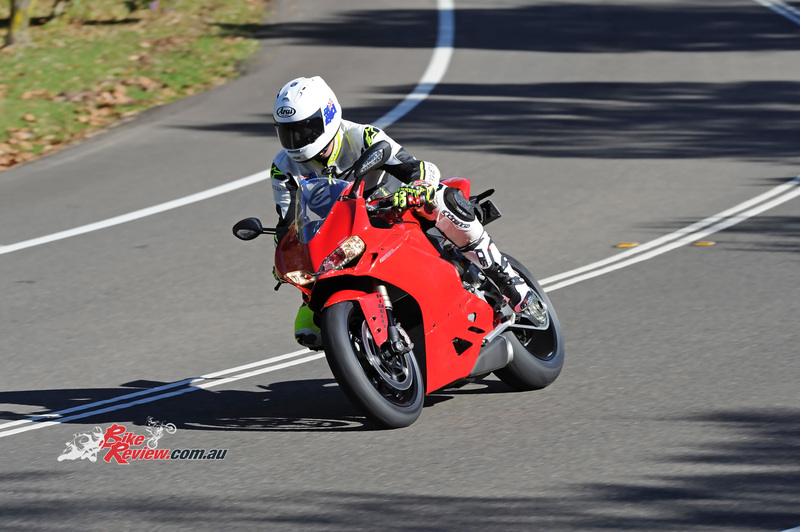 The next day I gave the bike a wash, something that is a nice experience on a bike as well finished as a high-spec Ducati. 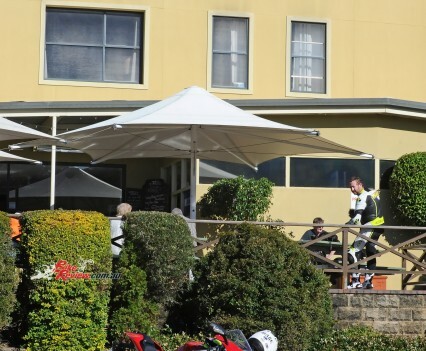 I then rode to Sydney to drop it off at Ducati Australia NZ, where I had the opportunity to chat to multiple Pro Twins Champion, Craig McMartin. 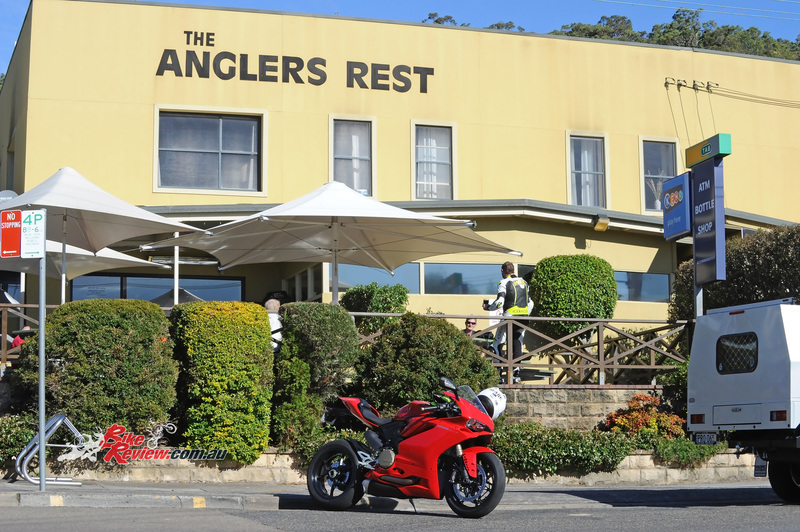 Craig had done 800km on the 1299 during Turismo and agreed, it really is a much better street bike now and for $27,990 + ORC and 24,000km service intervals, represents good value. 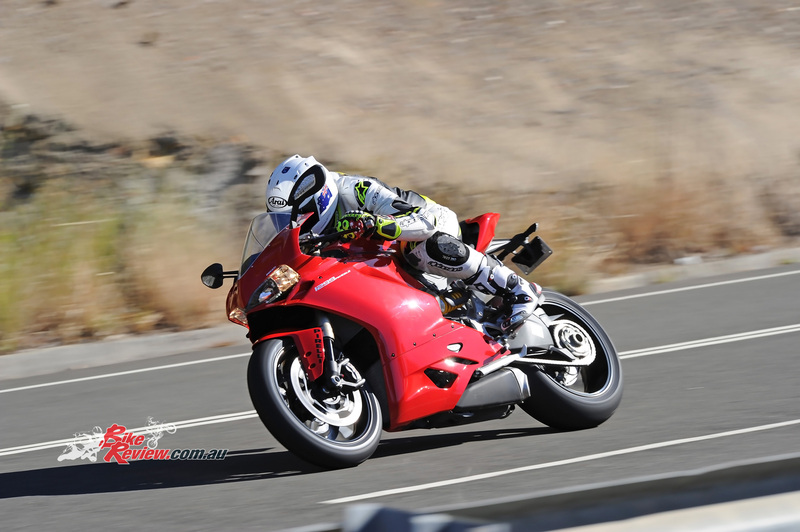 If you are in the market for a new large capacity sportsbike and want to enjoy it on the street and track, the Panigale 1299 is now a real option for you. 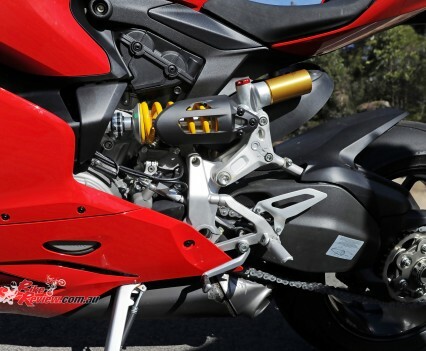 The new 116mm diameter pistons have led the Superquadro to set new records. The pistons have been redesigned as have the piston ring and the oil ring, while the pin has a DLC (Diamond Like Carbon) facing. The compression ratio has increased to 12.6:1. The cylinders, still at a 90 angle to each other, are rolled back for a 21 angle between the front cylinder and the horizontal plane. This allows the engine to be placed further forward. The crankcases are vacuum die-cast using Vacural technology. This procedure guarantees maximum weight-saving, consistent wall thickness and superior strength. 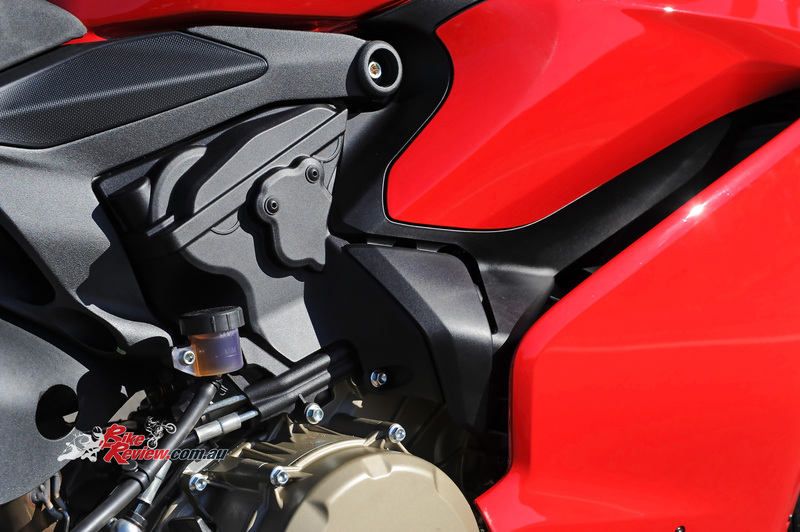 The cylinder-heads have been improved to guarantee greater rigidity, as in the case of the magnesium head covers and those on the clutch side. The oil sump is also in magnesium. 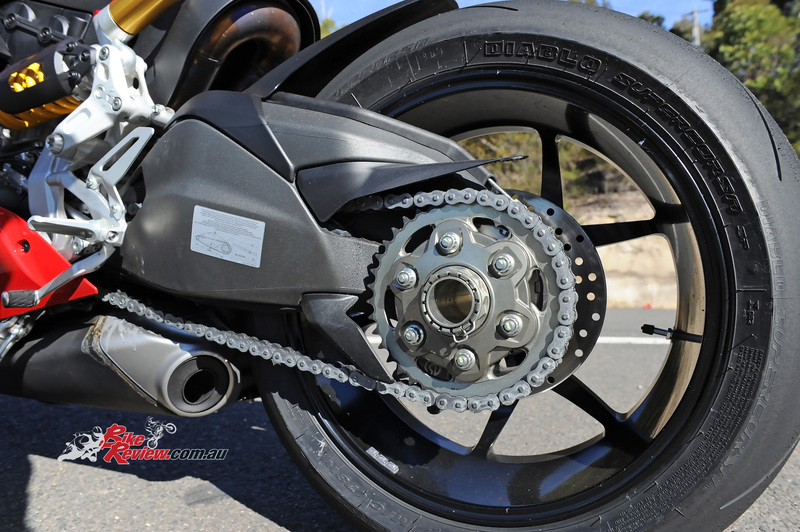 The crankshaft is balanced and the conrods revised to support the greater load of the 116mm diameter pistons. The main journals are lubricated with compressed oil through dedicated channels within the base. This method ensures the crankshaft is sufficiently lubricated and the oil is swiftly collected, thanks to an advanced feature – a lobed pump that creates a vacuum in the crankcase. This keeps the crankcase area below the pistons in controlled conditions of constant vacuum, reducing resistance during downward movement and crankshaft rotation. 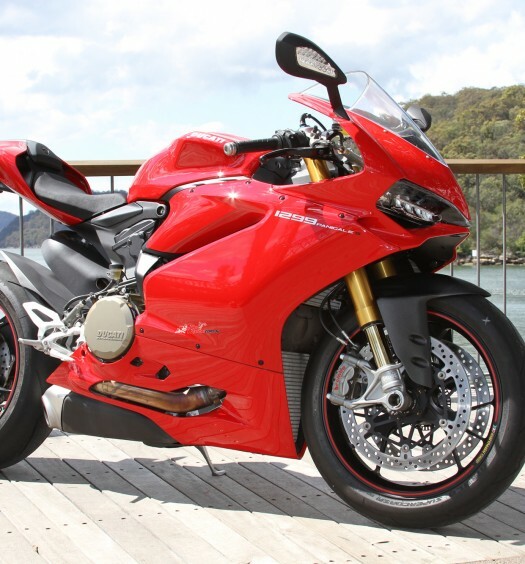 The 46.8 mm diameter titanium intake valves and the 38.2mm diameter exhaust valves are of exactly the same dimensions as those of the Superquadro 1199, so are the throttle bodies, which again have an oval section and a diameter equivalent to 67.5 mm. A chain connects the crankshaft to a gear fixed to the head and another set drives two other gears fixed respectively on the intake and exhaust camshafts. At the end of the exhaust camshaft of each head, there’s a centrifugal decompressor, enabling the use of a very small electric starter and a much smaller battery than in the past. 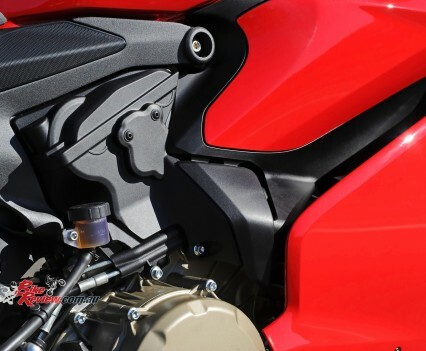 Transmission is managed by a six-speed gearbox together with a wet clutch that has a progressive self-servo mechanism that allows the load on the disc to be increased without compromising the lever force required by the rider to operate the clutch. 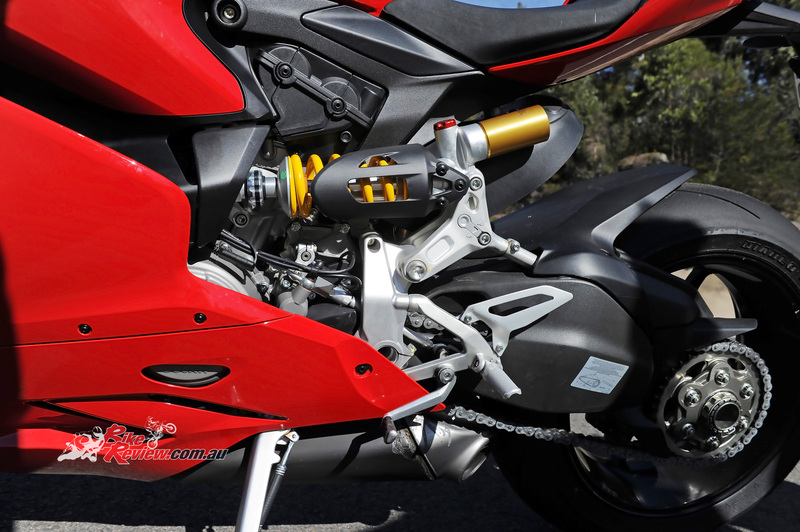 This result is an optimal combination of the requirements for a high torque transmission together with a high level of comfort for the rider. 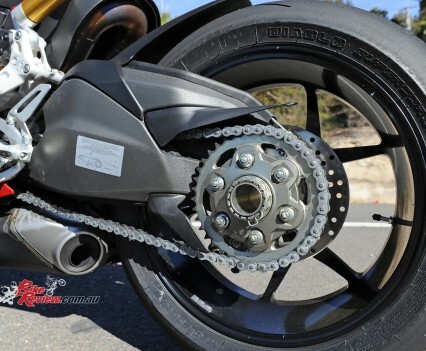 Under sports riding conditions, with repeated downshifting and aggressive deceleration, the same mechanism reduces pressure on the clutch disks, allowing them to work in slipper clutch mode. 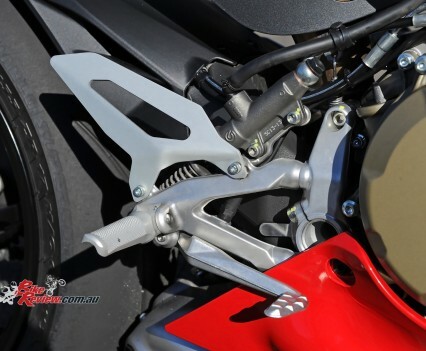 The compact alloy monocoque structure uses the Superquadro engine as a structural element. 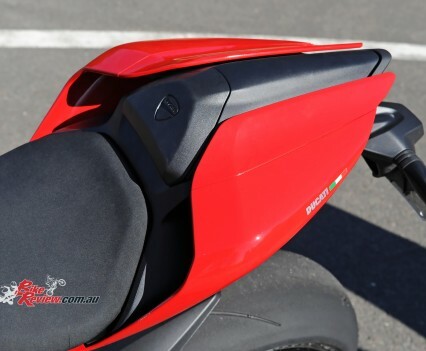 The monocoque also acts as the airbox. Fitted inside, along with the air filters, are the throttle-bodies and the fuel circuit, complete with injectors. 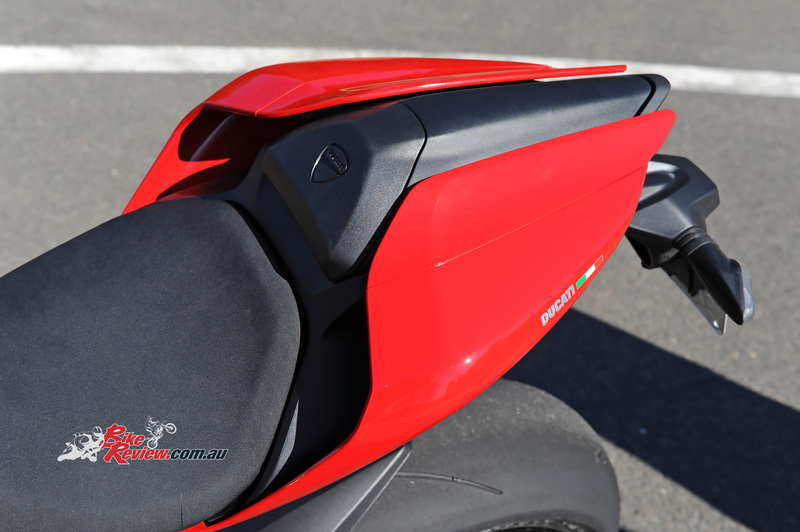 When the aluminium tank is mounted, its bottom portion seals the airbox as a top cover. 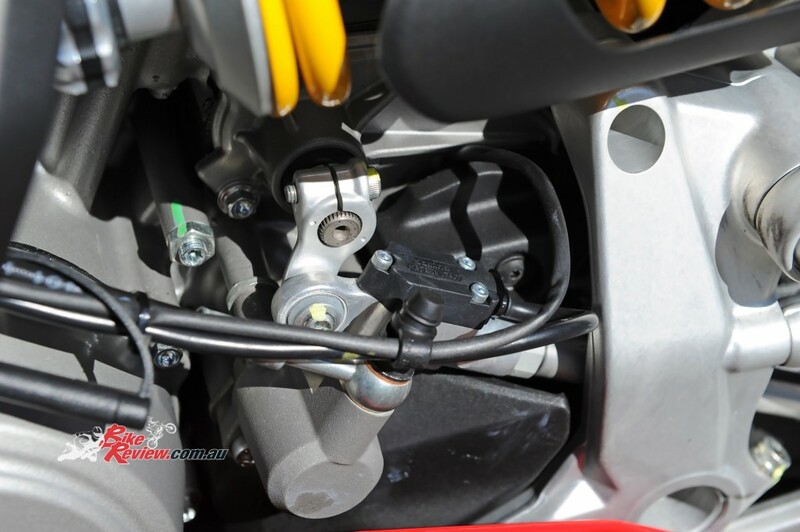 The steering head angle has been modified for the 1299 Panigale from 24.5 to 24 and the trail has been reduced from 100 mm to 96 mm. 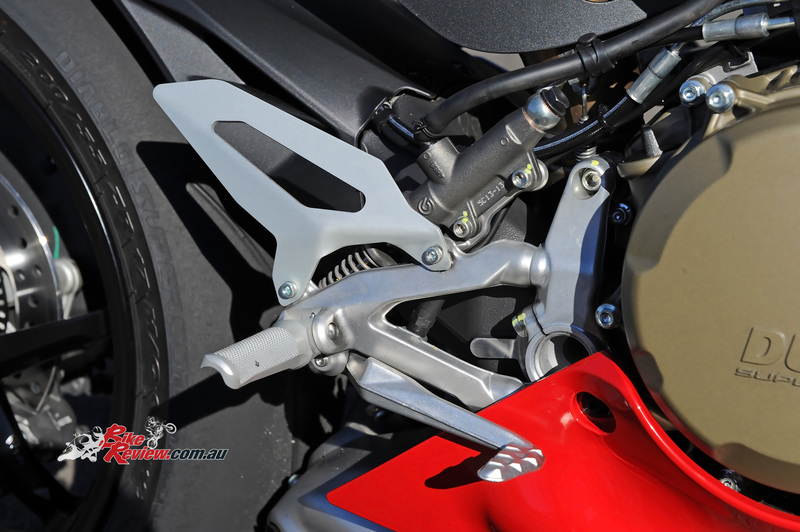 The new chassis setup also includes a single-sided swingarm with a 4mm lower pivot point. 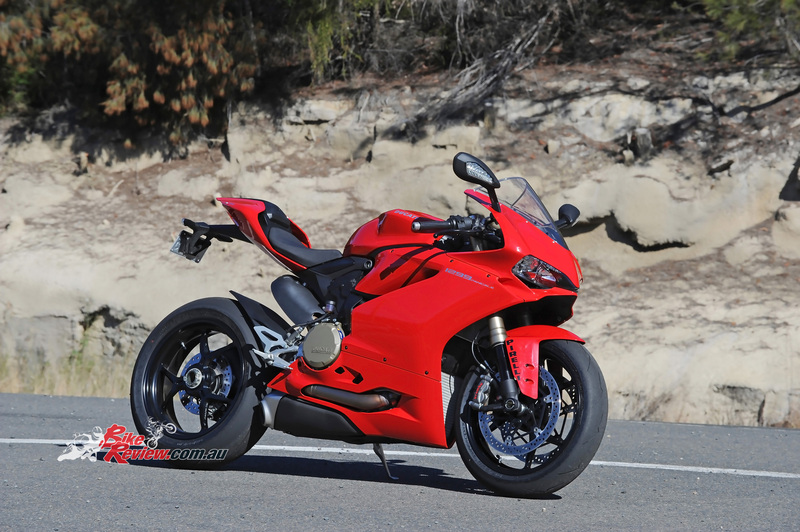 The total wheelbase of the 1299 Panigale is 1437mm while the distribution of weight is 52/48. 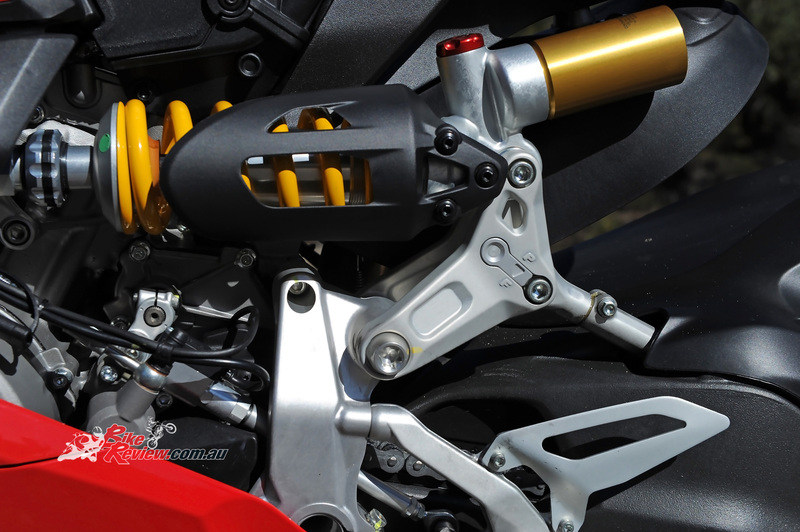 Forks are pressurised 50mm Marzocchi units with anodised aluminium sliders. 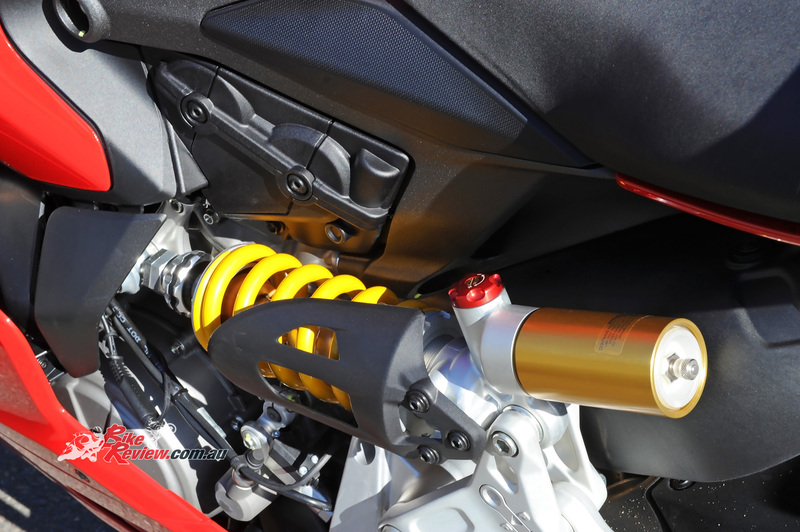 A Sachs shock absorber that is also fully adjustable looks after the rear. 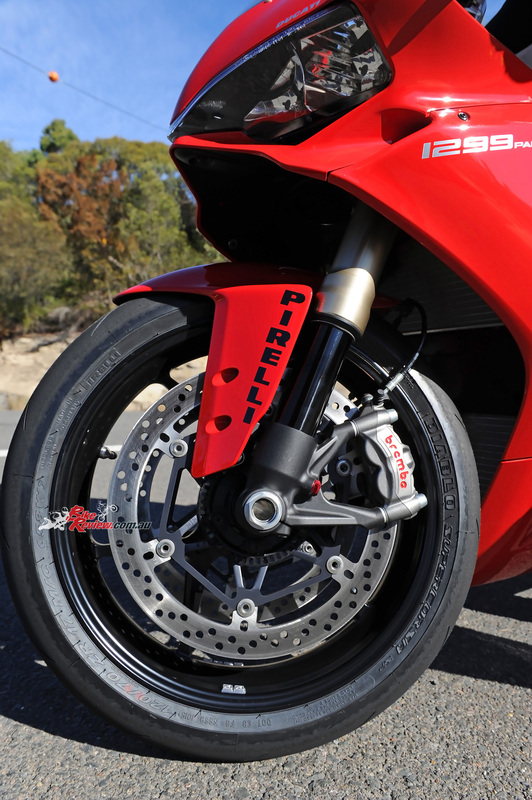 The 1299 is equipped with monobloc Brembo M50 calipers and the new Cornering ABS system that uses the extremely lightweight Bosch 9.1MP ECU. Wheels are cast aluminium tri-Y spoke 3.5in and 6.0in items. 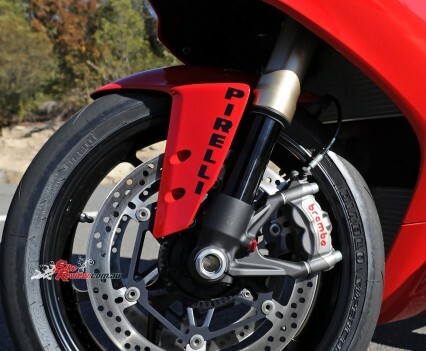 Pirelli Diablo Supercorsa SP tyres are standard kit. 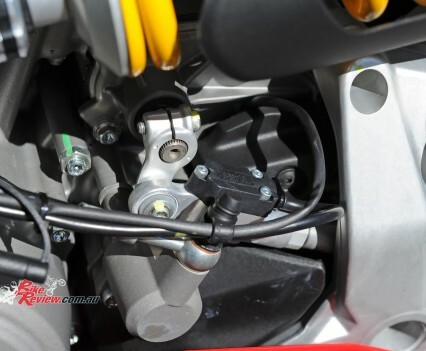 The 1299 Panigale is equipped with the Ride-by-Wire (RbW) system, the Ducati Data Analyser (DDA+) and the Ducati Riding Modes, which interact differently with the Ducati Traction Control (DTC), the Ducati Wheelie Control (DWC), the Ducati Quick Shift (DQS), the Cornering ABS and Engine Brake Control (EBC). Race Riding Mode: 205hp with direct throttle response. 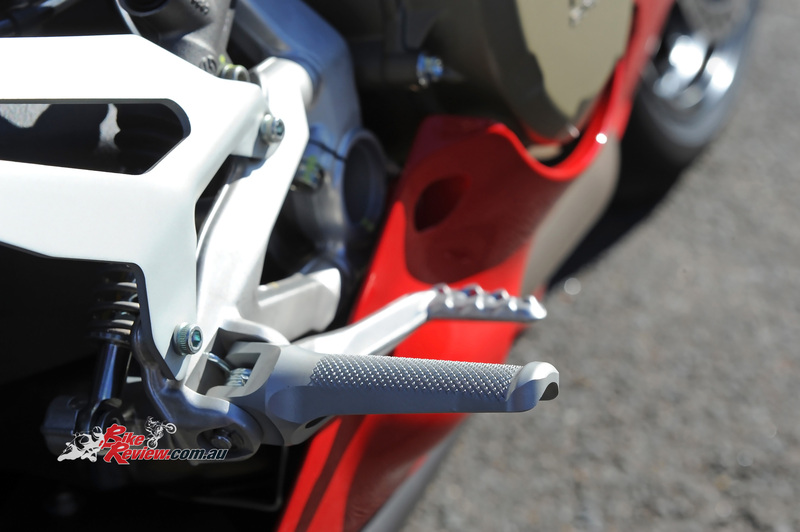 The Race mode includes a predefined level of DTC, DWC, EBC and ABS set for maximum performance on the racetrack – only active on the front wheel and with the Cornering function not engaged. Sport Riding Mode: 205hp with a sports throttle response. In Sport mode, the predefined levels of DTC, DWC, EBC AND ABS are set for sports performance on the road. Control of back wheel lift when braking is activated and the Cornering function setting provides maximum performance when cornering. 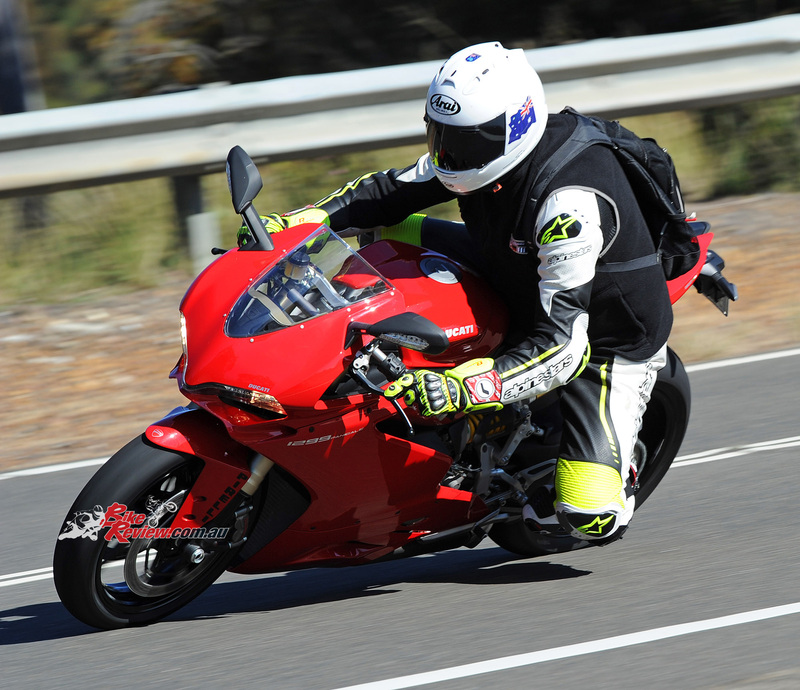 Wet Riding Mode: 120hp with a gentle throttle response. 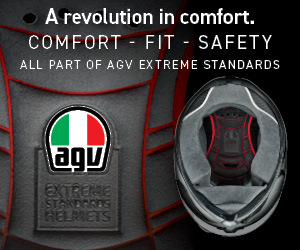 The predefined levels of DTC, DWC, EBC and ABS are set to provide maximum safety, completely eliminating back wheel lift when braking and the Cornering function setting also provides maximum safety. 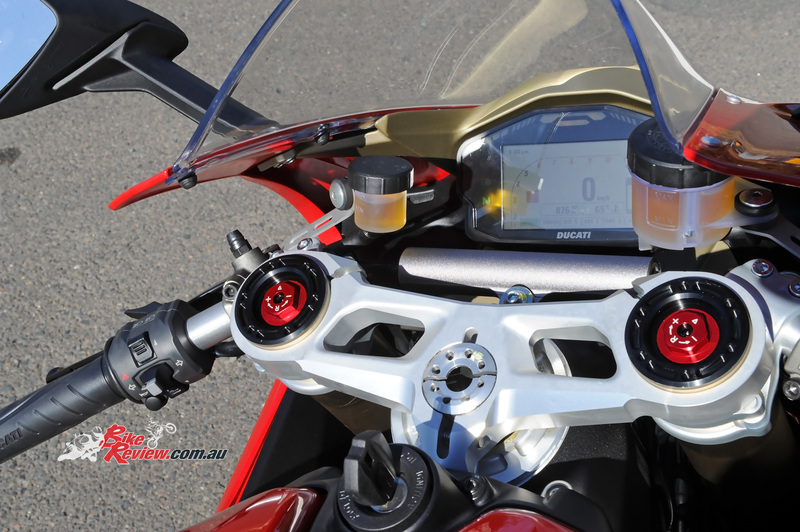 Ducati Data Analyser+ GPS (DDA+ GPS): With the Ducati Data Analyser (DDA), which includes Mac-compatible software and a USB data recovery device, it’s possible to evaluate the performance of the bike and the rider, with graphic presentations for specific areas of data. 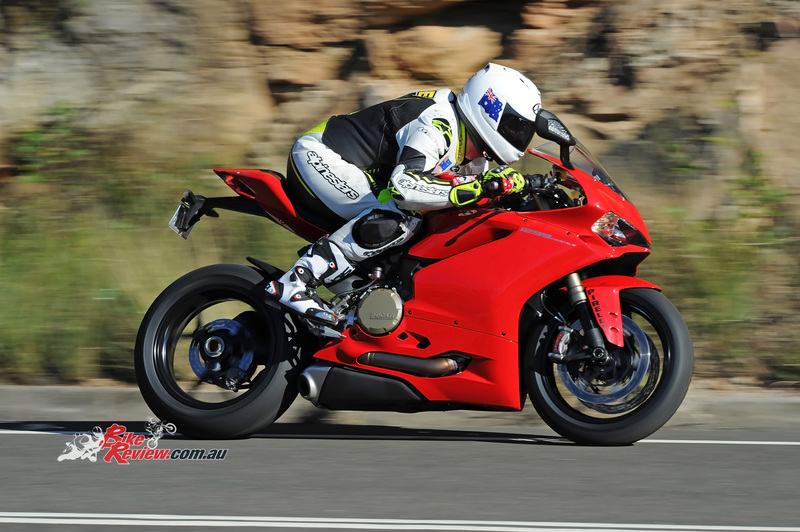 The DDA+ GPS is the latest generation of the Ducati Data Analyser with GPS function and it automatically records the timing of each lap every time the 1299 Panigale crosses the finish line of a racetrack. 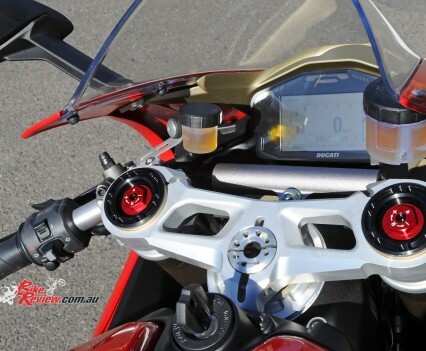 When the rider, crossing the finish line, presses the high-beam flash button, this highly innovative system records the coordinates of the position and then records the timings of each successive lap once it’s been completed.